The herd’s owners the young Tod and his aged grandmother Ida, follow their animals, trying to bring them home. Also chasing our woolly heroes are the men in the yellow car. The shady and dishonest Luke and Neil, who will stop at nothing, to recover what the sheep have unwittingly stolen from them. This entertaining story of earnest, lovable heroes and their journey is humorous from the outset. The laughter and fun flow throughout the book with its comical characters. There’s Links the Lincoln Longwool’s reggae rapping and Wills the Welsh Baldwin lamb’s ability to read tube maps. Not to mention Jaycey the pretty Jacob with her painted hooves and Oxo the Oxford rams love of cabbage. All of them willing follow Sal the Southdown Ewe, to the North, using a variety of public and not so public transport. 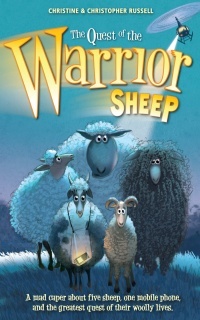 The authors manage to join the modern world with old style story-telling, as the fleecy warriors romp up the British countryside. Taking down sheepy pre-conceptions, the kickass and clever herd cause mayhem and havoc. All use teamwork, self belief and determination, in order to reach the holy Aries and defeat Lambad the Bad. As the villains of the book get closer and closer, a twist including, a secret military base and a super thief reveal themselves. This unexpected development lends the tale another funny layer that adds to its comically sweet plot. Other characters including a love-struck farmer, who is convinced alien abduction is at work, an uninterested in sheep, sheepdog and mountain rescue ravens, all contribute to the fun. The narrative voices of all the characters are individual and well thought out. Each fits in with the fast paced plot and each other. They are core to this convincing and entertaining story. By using strong and vivid imagery in their settings of London and the English and Scottish countryside the authors create realistic backgrounds. This supports the colourful plot and characters. This mad caper of a story with its funny and wholly entertaining characters will certainly keep anyone hooked. It takes you in and makes you firmly root for these baaaarmy agents of wooliness. Forget everything you thought you knew about sheep, the Eppingham posse has arrived.